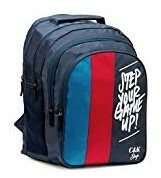 Buy Chris & Kate Big 42 Litres Comfortable Blue-Red Casual Backpack. Its lightning deal. Hurry buy this deal befor price change or deal expired. Join Amazon prime membership or fill your cart for Rs.499 or above or to get free delivery at home. All our readers can get Amazon Quiz Answers Today, How To Use Paytm, Free Mobile Recharge and best updated loot deals only. For more lates online offers, tricks and loot deals keep visiting our site regularly. Water ressistant – No, compartments – 4, Laptop compartment – Yes, front and main padded can put cell phone, pen, power bank, wallet and other accessories. Utility – Office, College, School, Camping, Weekend trip, Day trip.